There is possibly no area in Jewish life with as glaring a gap between the ideal and the reality as the area of STaM, (an acronym for Sifrel Torah, Tefillin and Mezuzos). 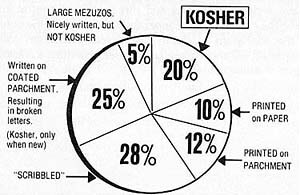 Can we reconcile the great love, respect and adherence which Jewish people of all walks of life have shown for the observance of the mitzvah of Mezuzah1 with the statistical reality that 80 of every 100 Mezuzos that are checked are posul (unfit)?2 (See charts). How is it that we have so few scribes in the United States, when the mere inspection of Mezuzos4 and Tefillin for all those who observe these Mitzvos, and the correction of Sifrei Torah, would require at least the employment of hundreds, if not thousands, of Sofrim (Scribes)? Is it possible that a field to which Halachic guidelines are so central and so complex remains devoid of accountability and safeguards for these basic guidelines? And now the ultimate question: How is it conceivable that we remain so blind and ignorant of the problems surrounding STaM a set of problems relevant to each and every member of our people, every single day? The purpose of this overview is to explore this problem, to identify its causes, understand what led to its growth and point to workable solutions. Isn’t he right? Theoretically, yes. But when we compare that which actually does exist in the area of STaM with that which should exist, we find that our theoretical assumptions are not operative. In order for STaM to be kosher they must meet certain absolute standards which were transmitted to us by our Talmudic sages as given to our teacher Moses at Sinai (the very same source which serves as our reason for placing a Mezuzah on our doors or putting on Tefillin in the first place). These standards concern themselves primarily with the form of the letters and the procedure used in writing them. The Lettering – There are 27 letters in the Hebrew alphabet. Formation of each letter and its parts are governed by a specific set of laws and regulations. Often the slightest change (unnoticeable to one who is unfamiliar with this field) may render the letter and, consequently, the entire Mezuzah, Tefillin or Sefer Torah unfit. The Writing Process – An entire literature of Halachos and rules govern the exact procedure used in writing these words,6 and the methodology of making corrections.7 This process is not subject to any retroactive inspection since it is not recognizable within the finished product.8 To be certain of the Halachic kashruth of STaM we are forced to rely on the integrity of the producer – the sofer (scribe). Every possible form of forgery and deception currently exists in this area. 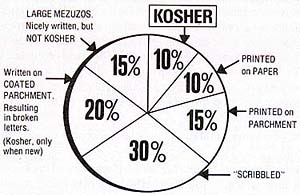 Before the establishment of the Vaad, the vast majority of Mezuzos available on the market did not even meet the minimal requirements of Halacha. A large number of the Mezuzos sold contained doodles in place of letters,9 not to mention the many Mezuzos which were printed (rather than written) on parchment or paper or contained substitute phrases for those actually required in the Mezuzos. Craftsmanship – The scribe must learn the technical aspects of creating the letters and practice the execution of each letter in accordance with the requirements laid down by Halacha (this is the easiest part). Scholarship – Since the Halachos of the letters and the process of their writing are many and complex, the scribe must attain full mastery of this section of the law. He must continuously study and review them, since ignorance of even one single Halacha may render all his writing unfit. If the scribe is ignorant of a law relating to the exact form of a letter, it will become apparent upon inspection of his writing. But if he is ignorant of the exact procedure to be used in forming the letters, all of the STaM which he writes are unfit. The saddest thought is that no one will ever know it. Reliability and Trustworthiness – There are many intricate details which may serve to render STaM unfit. No person other than the scribe is likely to be aware of these. Every scribe frequently finds himself in a situation where he must render unfit and remove from circulation a product on which he may have worked a full day or two. We must therefore be certain that the scribe is a man possessing the highest level of conscientiousness and integrity, to be assured that he will withstand such a test. The facts in this area are simply frightening. An even smaller minority of scribes have passed examinations given by recognized rabbinical bodies or been certified as scribes. A significant number of those who write STaM are not even religious. A Mezuzah has 713 letters, the Tefillin 3,188.14 Every letter has a number of laws pertaining to its form.15 In order for a Mezuzah to be written in accordance with all of the laws, it must thus meet thousands of requirements.16 If even one of the 713 letters in a Mezuzah is missing or shaped incorrectly, the Mezuzah is rendered invalid, the Mitzvah is unfulfilled, and the b’racha recited over it is in vain. Even the best scribe is human and subject to error. While some errors may be corrected in accordance with Halachic decree, others cannot. STaM, even when written by the most expert of scribes, have many possibilities of being unfit. They therefore must be inspected before being purchased. Painstaking examination of a Mezuzah. Most people do not have their Mezuzos checked periodically as required. In most areas of the United States and Canada there are almost no scribes available for the inspection of STaM. What are the causes of this intolerable conflict between the ideal and the reality? Although it is difficult to point to one single cause, it is possible to describe the causes and the processes at work behind the widespread deception. Before we do this, however, it is important to be acquainted with a number of givens in the marketplace of STaM. The main determinant of the price of STaM is labor. The parchment and ink make up only a small percentage of the cost. The process of creating a letter is not simple. The writing of a single Mezuzah takes from 2½ to 3 hours. The differences between the cost of labor in the United States and in Israel create large differences in the price of STaM written in these countries. Consequently the United States produces less than ½ of 1% of it’s need;19 the rest are imported. There is no personal relationship between the buyer and the writer of STaM.20 The STaM pass through many hands before they reach the buyer. Most of the market is in the hands of retailers rather than scribes. There is a definite causal relationship between the trusting attitude of the consumers of STaM (including the merchants who buy from the scribes), and the increased flooding of the marketplace with possul Mezuzos. Let us examine two examples of how this vicious cycle operates. The Dearth of Scribes (inspectors) in AmericaBecause of the almost axiomatic belief that there is very little ground for deception in the area of STaM, there exists a lackadaisical attitude regarding inspections upon their purchase. Such inspections would, undoubtedly, uncover a large percentage of unfit or possul Mezuzos. The lack of demand for inspections discouraged the development of a generation of inspectors (scribes). Consequently, even thosewho do seek inspection find it difficult to secure a scribe, and accept the reality, leaving their STaM uninspected. Since the existence of the unfit Mezuzah thus remains hidden, people have come increasingly to believe that there is no cause to suspect deception in this area, and therefore, no reason to seek inspections. Thus, we have come full circle.Our second example is one of the more classic tragedies of this field. The “Smeared” MezuzahThe marketplace offers the buyer a class of Mezuzos at half price, approximately $6.00 – $8.00. The investment of the manufacturer for this Mezuzah is approximately 1/8 of that required for standard Mezuzos. As a first step in making these Mezuzos, the parchment is coated with a thin layer of paint before the scribe begins to write.21 This process makes it possible to complete writing in twenty minutes to a half hour instead of the usual 2½ to 3 hours required for a standard Mezuzah (because of the difficulty of writing on parchment which is naturally uneven in texture).Aside from the Halachic problem of writing on a smeared parchment22 the sale of such merchandise is outright misrepresentation. Even if this Mezuzah were written according to Halacha, it would remain usable only until encased. The slightest fold would be likely to crack the paint resulting in the breaking of the letters and the ultimate invalidation of the Mezuzah.23 Would a sensible person knowingly buy such a product? In this respect, a vicious cycle also exists.Years ago, smeared Mezuzos comprised only a small percentage of the market (as reputable scribes would not write on a smeared parchment). However, the trusting attitude of the unsuspecting public has created an increase in the demand for cheap Mezuzos. 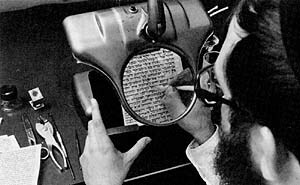 Consequently, the number of those who write on smeared parchment has increased (especially since they realize greater profits than the reputable scribes who write Mezuzos on unsmeared parchments).Until recently, before the intervention of the Vaad, smeared Mezuzos comprised 80 to 90% of the market and had become the norm, whereas standard Mezuzos had come to be known as the “expensive ones”, and were considered luxury items created for the exclusive use of a special class of pious Jews. 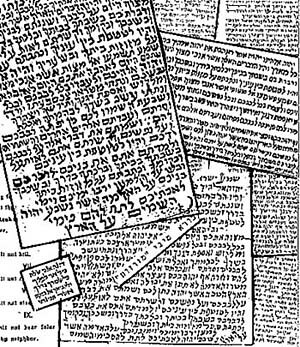 the situation had reached such astronomic proportions that Israel’s Ministry of Religion, when asked why it did not fight this phenomenon, responded that it has indeed attempted to obligate the scribes to use exclusively non-smeared parchment, but realized that it was beyond its power to alter the situation. the vicious cycle of deception had thus been completed and the unsuspecting public had fallen prey to its own trusting attitude. “It was this desperate situation that brought about the active involvement of the Israeli Chief Rabbinate. If the individual buyer does not insist upon inspection of the Mezuzos in accordance with the Halacha, then it is he who is creating a generation of unscrupulous scribes. If the consumer does not ascertain who the writer of the Mezuzah is, then it is he who is responsible for the creation of a cadre of irreligious scribes. If the consumer is remiss by not ascertaining for himself that the writer of a Mezuzah is a certified scribe, well-versed with the minutiae of halacha, then it is he who is responsible for this abominable situation. Unless and until the consumer demands controls, the area of STaM will remain without supervision, and forgeries will go unchecked and increase dramatically. This is what is demanded of the laymen-to stop the vicious cycle and reverse it. Are we asking for the impossible? The consumer created the problem and only the consumer can solve it! In 1935 a central organization, Shomrei STaM25 was created in Europe by 87 of the leading sages of that generation. They set for themselves a specific program, which was largely geared toward mass education of the buying public. Unfortunately for us, before they could carry out their program, their sacred work was cut short by the holocaust. In 1975 Vaad Mishmeres STaM26 was organized in the United States. The stated purpose of this organization was to create a revolution in the area of STaM. Its goal, first and foremost, was to organize the consumer and, with cooperative efforts, stop the avalanche of deception. Occupying a primary position among its various programs is a public education drive (described at length at the end of this booklet), utilizing various public forums and programs. This “Guide to Mezuzah” is published as a basic tool in this drive. That the educated consumer who is scrupulous and demanding, aware that the field of STaM is a field fraught with fraud, receives a Mezuzah in which every single letter is written in absolute accordance with Halacha. That the educated consumer who probes the origin and source of his Mezuzah, creates a situation whereby those unfit to be involved in this holy work will turn to other careers. That the educated consumer who demands that the writer of the Mezuzah be a certified scribe, well-versed in the Halachos, force scribes to learn the Halachos and subject themselves to examinations by a Bais Din for certification. That the educated consumer who will demand proof of the authenticity of the Mezuzah, will help to create a demand for supervision in this area which will eliminate the various forgeries. That an educated public that cares about the inspection of STaM will make possible the development of a new generation of scribes in the United States who will eliminate the shame of the present reality. Since only you, the educated consumer, can help solve this problem, Vaad Mishmeres STaM presents this “Guide to Mezuzah” as a basic primer a first step in your education. The Vaad invites you to read it and to learn from it. It is hoped that it will fulfill äùòî éãéì àéáîä ãåîìú ìåãâ learning which will generate deeds and activities on your part in behalf of the sanctity of STaM. 1. So precious is the Mitzvah of Mezuzah that the Torah distinguishes it from other Mitzvos in promising “Your days and the days of your children will be prolonged” (Deuteronomy 11:21). · For this very reason women, like men, are obligated in this Mitzvah. As the Talmud states, “Do only men require life? Do women not require life?” (Kiddushin 34a). . It is a Mitzvah that brings divine protection to the home (Tur Yoreh De’ah 285). The Talmud, Midrash, Zohar and codes are replete with references stressing the protection afforded by the Mitzvah of Mezuzah. 2. In one of the most religious communities in canada, of the 1,018 Mezuzos examined for their validity, 95% were found to be unfit. In another prestigious community in New York city, of the many hundreds of Mezuzos examined, 83% were declared unfit for use. In a campaign conducted in one of the largest Yeshivos in Brooklyn, where each child brought a Mezuzah from his own bedroom, 81% were possul. 3. The majority of Torah Scrolls in American synayogues are from 50 to 100 years old and, with this passage of time, their lettering is apt to deteriorate A good many of these scrolls are not used, but had those in use been subjected to inspection, most would have been found unfit for use, sorely in need of repair. 5. The article was reprinted several times by Vaad Mishmeres STaM and is available through its offices. 6. 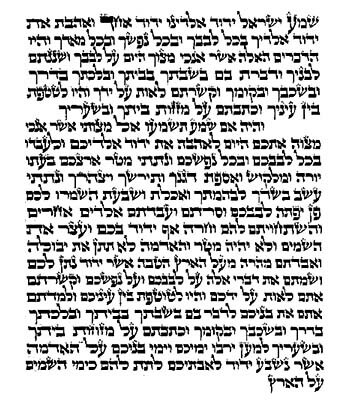 The source of these Halachic prescriptions have their origins in Talmudic literature and their primary commentaries, Code of Jewish Law as well as Responsa, These laws are encapsulated in the modern day Mishna Brura Chapters 32 through 36 with the Mishnath Sofrim addendum authored by the renowned Chofetz Chaim. 7. It must be realized that the scribal art is a form of calligraphy that requires diligent concentration and any slight distraction is likely to cause errors. 8. Examples of this are (a) äîùì – prior intention (see guide II B), (b) ïøãñë – proper order (see guide II C), (c) úåëåú ÷ç – etching (see guide 11 E). 10. See Keses HaSofer 1:1, Pri Megadim-EisheI Avrohom 32. 12. The scribe produces the most sacred of artifacts in Jewish life to enable Jews to fulfill the Mitzvos of STaM according to Halacha. Because of the awesome responsibility placed on him, age-old traditional standards made it incumbent on the scribe to receive rabbinical sanction through testing his requisite knowledge and expertise in the scribal craft and ascertaining his good moral character and integrity (see Sefer Hazichronos 9:3 authored by Rabbi Shmuel Abuhab 1610 – 1694; Bais Ahron 7:7, Mishnas Avraham 18:8; T’nufah chaim 432; Responsa Ma’hari Assad 298). The Chasam Sofer (in his introductory approval to the Keses HaSofer) commanded that no Rabbinical court give authority to any scribe unless he was proficient and well-versed in the minutiae of the Keses HaSofer. Any scribe who did not master this knowledge should be discharged from his craft. 14. 1594 letters per phylactery. 15. 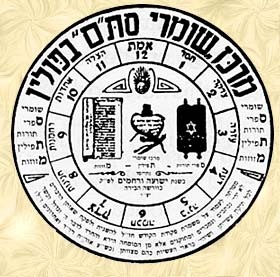 According to the Halachic commentary Mishnas Sofrim (of the Mishna Brura) the 27 letters of the Hehrew alphabet encompass 165 laws which govern them. 16. In order for a Mezuzah to be deemed valid in the first instance, 4649 laws must be fulfilled. 18. The majority of consumers purchase sealed Tefillin without even seeing the contents (written parchments). 19. Understandably, this figure does not take into account the myriad of invalid mechanically printed Mezuzos in the United States and Toronto, canada which needn’t be imported. 20. in generations past, when one sought to buy Tefillin or Mezuzos, he contacted the scribe of his community who was generally the only sofer in town and well-known to his local Rabbi who, himself, employed him for scribal writing. The Rabbi’s association with him was sufficient approval regarding the scribe’s integrity. Today, however, the origins of imported STaM are unknown to the consumer and are, thus, suspect. 21. Any individual can easily recognize the glossy smooth white finish that is visible on the written side of a smeared Mezuzah which differs markedly from the natural cream white color of unretouched parchment. 22. Many authorities invalidate smeared Mezuzos because the paint is an interposition between the written letter and the parchment. The Chasam Sofer compares this procedure to one writing on paper and pasting it to parchment. See Keses HaSofer 2:12. 23. If, perchance, a smeared Mezuzah withstood cracking when folded, it would inevitably succumb to the natural climatic elements. Summer heat inherently expands and winter cold inherently contracts pliant parchment while leaving the dry paint untouched, resulting in cracked letters. In the rare instance when the Mezuzah is thinly coated and the process of such coating results in the paint being ingrained in the parchment, then and only then is the Mezuzah likely to last longer. 24. Mishnas Chachamim chapter 228. 25. The essence of their detailed program, which was circulated throughout Europe, has been reprinted by the vaad and is available free of charge upon request through its offices. 26. A non-profit organization for the preservation of STaM.